We have received a lot of requests about the show Cowboys on Outdoor Channel. Many thought Cowboys disappeared last week and was canceled by the network. Reason for this is that Outdoor Channel changes air times every quarter and this is confusing for those who have set their TiVo or DVR to record their favorite shows. Same thing happened last week when 2nd quarter shows started airing. 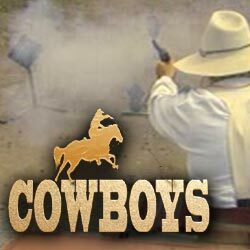 The air times for Cowboys during the period of April – June is Wednesdays at 4:00PM and 11:00PM. For thos who like to stay up late, a third run is on Thursdays at 3:00AM. All times eastern. In this new quarter, the channel will show another rerun of Cowboy Classics before a new season with 13 brand new episodes premieres in July. Our exclusive 2-part coverage of the fastest cowboy match in the world, held every year in Piru, CA, where the top men and women cowboy shooters duke it out or the fastest gun in the (new) west. Second part of our exclusive coverage of the fastest cowboy match in the world…now things are starting to tighten up in both the men’s and women’s races…it’s time to pick up the speed with those old smoke wagons! You’ve seen cowboy action shooting on COWBOYS and, yes, you’re interested…but how do you really get started? Here’s the inside scoop from the best in the world! The National Congress of Old West Shootists is another organization promoting western action shooting. Meet the man who invented the booming sport of Cowboy Action Shooting, Harper Creigh – a.k.a. Judge Roy Bean, “The Law West of the Pecos” and SASS #1.